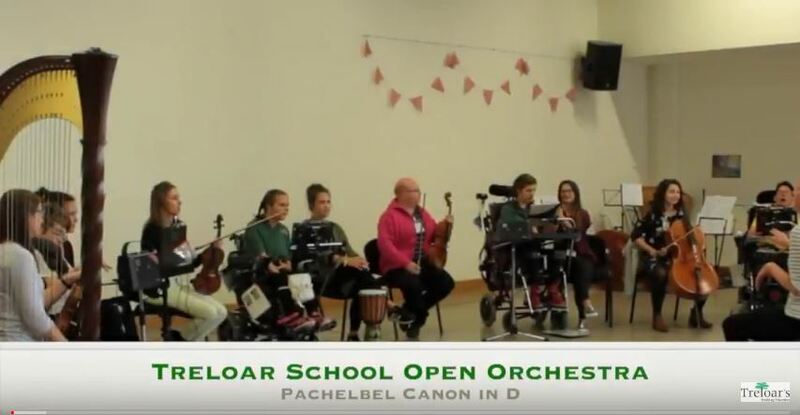 Four students from the School’s Open Orchestra and a quintet of Lasham Festival Players recently performed Pachelbel’s Canon in D (played in key of C). Lasham Festival Players and Treloar students rehearsed during the day before performing to the rest of the school, parents and some external visitors. Open Orchestra has supported students be able to perform on a musical instrument in a meaningful and expressive way. Clarion, the programme the students use, allows students to control pitch, tempo and dynamics as you would on a typical orchestral instrument. Students had been working on this piece every week and it was wonderful to see everyone collaborating to achieve such a successful performance. Being able to participate in music should have no barriers and this performance demonstrates this.